In the fall of 1864, the Civil War’s outcome rested largely on Abraham Lincoln’s success in the upcoming presidential election. As the contest approached, cautious optimism buoyed the President’s supporters in the wake of Union victories at Atlanta and in the Shenandoah Valley. With all eyes on the upcoming election, Robert E. Lee and Ulysses S. Grant conducted a series of large-scale military operations outside Richmond and Petersburg, which have, until now, received little attention. 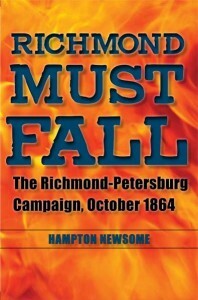 In Richmond Must Fall, Hampton Newsome examines these October battles in unprecedented scope and detail. The narrative begins with one of Lee’s last offensive operations of the war at the Darbytown Road on October 7, 1864, and ends with Grant’s major offensive on October 27 to seize the South Side Railroad, the last open rail line into the Confederate stronghold at Petersburg. The offensive would spark sharp fighting at Burgess Mill south of Petersburg and on the Williamsburg Road east of Richmond. The October 1864 operations offer important insights into the personalities and command styles of Lee and Grant, including Lee’s penchant for audacity and overwhelming thirst to strike a blow against his opponent even against bitter odds and Grant’s willingness to shoulder heavy responsibility in the face of great risk. The narrative explores the relationships within the high command of both armies, including Grant’s sometimes strained partnership with the cautious George Meade. It also illustrates Grant’s efforts to guide the strong-willed political general Ben- jamin F. Butler, whose steadfast support for African American troops would spark a prisoner controversy that would bring the war’s underlying issues of slavery and race into bold relief. For the Confederates, the month’s operations illustrate Lee’s necessary reliance on his key combat commanders at Petersburg, including the formidable William Mahone. Drawing on an array of original sources, Newsome focuses on the October battles themselves, examining the plans for the operations, the decisions made by commanders on the battlefield, and the soldiers’ view from the ground. At the same time, he places these military actions in the larger political context of the fall of 1864. With the election looming, neither side could afford a defeat at Richmond or Petersburg. Nevertheless, Grant and Lee were will- ing to take significant risks to seek great advantage. These military events set the groundwork for operations that would close the war in Virginia several months later. Author Hampton Newsome is an attorney who lives in Arlington, Virginia. He is an editor of Civil War Talks: Further Reminiscences of George S. Bernard and His Fellow Veterans. ReviewsRead a review from Strategypage.com, a military affairs website. Read a review from Civil War Book Review. Read a review from Civil War Books and Authors blog.